Global U is a quarterly e-newsletter, published by the Global Programs and Strategy Alliance. Global U features stories that spotlight international learning, discovery, and engagement across the University of Minnesota. 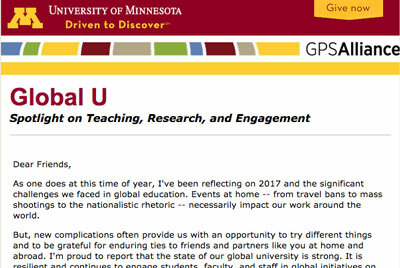 If you'd like to receive the quarterly Global U e-newsletter, please contact Meaka Pitschka at 612-626-9123 or meaka@umn.edu.